Addressing how such therapies can benefit developmentally delayed children. One of the most effective and widely used approaches today for teaching children on the autistic spectrum is applied behavioral analysis (ABA). This data-driven method has been successful for many children throughout the country. Providing therapeutic services to children diagnosed with autism has provided not only the privilege to meet amazing children and families, but also the opportunity to address the most frequently asked questions about ABA by parents. ABA uses principles of behavior to make meaningful changes. Having a structured educational program like ABA provides a consistent monitoring system and helps determine how much progress is made. The purpose of ABA is for children to be able to use skills within their natural environment. Skills are generally introduced in the form of discrete trials. Discrete trial training refers to teaching a specific skill in a structured and repetitive manner. Although it is an important tool, this is only a small part of ABA. During the trials, your child’s responses are always written down. It is also recorded if your child was able to demonstrate the skill independently or if prompts are needed. This provides teachers with exact information on what is working and what needs to be changed. However, once a skill is mastered one-on-one with the training adult, it is essential that your child has the chance to develop these skills in other settings, such as the classroom, the gym and the lunchroom, as well as with other people, including siblings, grandparents and caretakers. The ultimate goal is the generalization of skills from the classroom or home ABA program to family, social and societal settings. No matter what techniques are used, the ABA team should show family members how to practice skills with their child during “teachable moments” in everyday family routines. This ensures that skills are generalized and maintained. Working together in partnership, the ABA team and the family allow the child the greatest possibility for success. What types of behavior techniques would be used with my child? All behavior serves a purpose. It is very important to learn the function of the behavior. Why is your child performing certain behaviors? Reasons can include avoiding a task, gaining attention and receiving or avoiding sensory input. Realize that if your child is exhibiting an inappropriate behavior, it’s because at one time it achieved something for the child. It’s also good to note that overreacting to the inappropriate behavior won’t decrease it if your child wants attention. Rather, an overreaction may actually reinforce and increase the inappropriate behavior. Focusing solely on stopping this negative behavior can lead to a reactive punitive way of thinking. The principles of ABA consist of replacing the inappropriate action with an appropriate one. Teachers must observe your child across a variety of settings and times of the day when disruptive behaviors occur. Analyzing the collected data through observations is how the ABA team discovers the reasons behind inappropriate behaviors. Likewise, ABA programs are developed to reinforce positive behaviors and decrease the negative ones wherever these behaviors are observed. Remember, children are unique. Two children may be exhibiting the same behavior, but not for the same purpose. How does occupational therapy (OT) benefit my child’s ABA program? Occupational therapists work with children who need help making sense of the sensory information that they receive throughout the day. This includes all the information received from smells, sights, tastes, sounds, touch and movement. Children with autism may have difficulty processing sensory stimulation. Their ability to process information may be over active (hypersensitive) or under active (hyposensitive). A child may be engaging in problematic behaviors due to difficulties processing and understanding sensory information in the environment. Through observation and data collection, a plan is implemented that is the most appropriate for your child’s needs. If your child is eliciting these behaviors due to either avoiding or seeking out sensory information, specific sensory activities are performed prior to conducting ABA and educational programs. Some of the activities that can help your child with sensory processing involve gross motor movements, heavy work activities, proprioception vests (bear hug vests), weighted vest, swings and jumping. 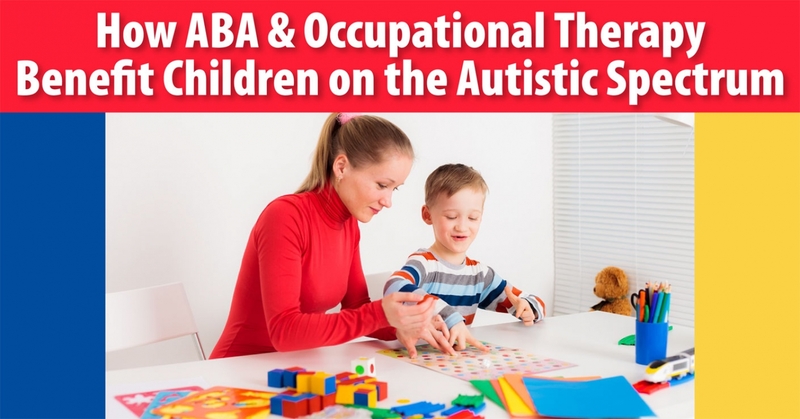 The occupational therapist works closely with the ABA team to provide activities and strategies to assist with completing the child’s ABA program. When developing an educational plan for your child, there are a variety of approaches to consider. First and foremost, remember that all children’s learning styles are unique and individual. The most effective approach is to take the child’s needs of the child and the child’s family as the highest priority. The end goal of therapists and families is ultimately the same: to help children realize and achieve their fullest potential. Ali Adlah, OTR/L, Christopher Cook, MS.Ed., BCaBA, and Melissa Vitarelli, MS.Ed., BCBA, are clinical supervisors for All About Kids, each with more than ten years of experience working with children on the autism spectrum. For more than 22 years, All About Kids has provided evaluations, therapy and educational services to children ages birth-21 and families. All About Kids plays an integral part of diagnosing children on the autism spectrum and developing ABA programs throughout New York City, Long Island and Westchester.